Budenase AQ Nasal Spray (Budesonide) is a synthetic anti-inflammatory corticosteroid which relieves hay fever and chronic rhinitis symptoms by reducing swelling in the nasal passages. It has also been used for nasal polyps. 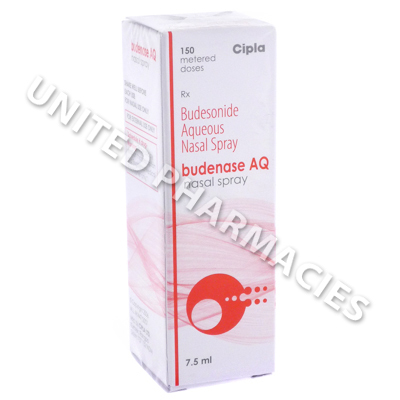 Budenase AQ Nasal Spray (Budesonide) is a synthetic anti-inflammatory corticosteroid which relieves hay fever and chronic rhinitis symptoms by reducing swelling in the nasal passages. It has also been used for nasal polyps. Hay fever is caused by pollen (from grass or other sources) and usually occurs during the pollen season. Year round nasal allergies (chronic rhinitis) is usually triggered by dust and can happen at any time. Patients affected by these conditions suffer from sneezing, nasal congestion and watery eyes. These symptoms are due to inflammation in the nasal passages. Use of this spray aims to combat these symptoms, and it has been theorized by experts that this may be due to its broad range of inhibitory action against cells (such as lymphocytes) and other potent mediators of inflammation (histamine, leukotrienes and cytokines). This in turn leads to a reduction in the allergic reaction and reduces swelling of the nasal passages, thereby relieving the symptoms of inflammation. Medical studies conducted to evaluate its efficacy in the treatment of chronic rhinosinusitis patients showed that it caused a substantial decrease in nasal discharge and congestion, and even brought about an improvement in the sense of smell in the morning. Budenase AQ Nasal Spray (Budesonide) is provided in a bottle which contains 7.5ml and is sprayed directly into the nose. There is enough spray to deliver 150 metered doses, and each spray will administer 100mcg of the active ingredient. In all cases, the necessary amount of sprays and required frequency of administration will be calculated by the doctor in charge of treatment. As well as this, you will be told by your doctor when to start and how long to continue treatment for. Follow all instructions provided to you. Your doctor must be informed if any reactions occur. Although less serious side effects are more common, severe reactions are also possible (however this is considered to be a less common occurrence). Attend the hospital immediately if you experience nosebleeds which are severe and persistent, breathing difficulty, problems related to eyesight, serious acne, eye pain or any other severe reactions that have not been mentioned here. This medicine could affect the liver in patients with liver problems, and your doctor may need to conduct regular medical tests if this applies to you. If you are affected by nosebleeds, inform your doctor before starting treatment. Always use Budenase AQ Nasal Spray (Budesonide) as you have been prescribed by your doctor. Never self-medicate or change your dosage without first consulting your doctor. The correct dosage can vary depending on your health, medical history, and the severity of the condition being treated.